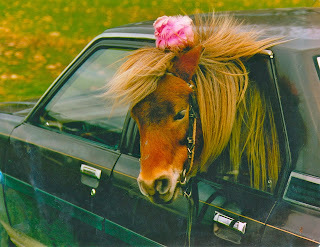 'Shandy,' the pony, attends an agricultural show in unconventional style - the back of an old Ford Cortina. WeLoveAnyCar.com highlights Government Guidelines on the transport of animals. The photo was taken by her owner, F.H, in a New Zealand farm. cars for a little light relief at Christmas. 'Shandy's' picture, posted on the WeLoveAnyCar.com Facebook page, highlights the difference in attitude of yesteryear to today's rules and regulations laid down for animal transport safety. Fiona Haward, now UK based, said, "We used to live in a New Zealand farming community where anything goes! People wore 'gumboots' to the supermarket, swapped veg for furniture and, yes, farm animals travelled in open trailers and even cars. 'Shandy' was a very small foal who a neighbour took to an agricultural show in his car....an old Ford Cortina"
DEFRA publishes a useful guide to transporting horses and ponies. The guide is in-depth but, in summary, the general guidelines would apply to most animals. A WeLoveAnyCar.com spokesman said, "Virtually every 'rule' has been broken by Shandy and her owner in the picture taken. However, the picture is reminiscent of days gone by, a 'Darling Buds of May' moment in our lifetime where many of us were delighted to own a Ford Cortina and a visit to an agricultural show was the highlight of the summer." WeLoveAnyCar.com car review site now has over 99,000 car reviews with more than 360,000 drivers giving a second opinion on the cars reviewed.